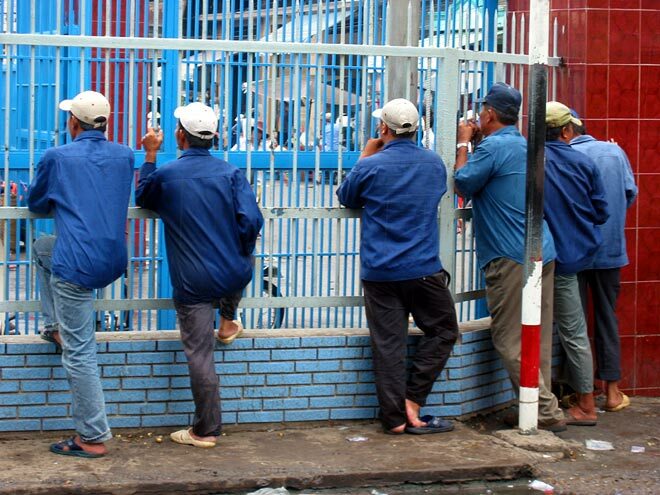 Over 300 workers at a Taiwanese company, Hwata Vina, in Ho Chi Minh City went on strike July 3 after complaining about managers’ draconian rules. They said that the company, which produces water tanks and Inox appliances for kitchens, had made unreasonable stipulations. For example, workers were permitted to go to the toilet just three times a day for five minutes each. Workers would not get paid for periods when electricity was cut. They were also asked to be present at the company 20 minutes before work started. Failure to do so, resulted in a deduction of VND100,000 each time a worker is late. The stipulations were made worse by the bullying and abusive language from managers. Director of the company, Ly Cheng Yeng said that the company did not have such rules, and it was the managers who set the regulations themselves. He apologized to workers for the bad treatment and pledged to correct the situation. The managers were also asked by relevant authorities to produce work licenses, they could not. Although Mr Yeng promised that the company would register the managers, the representative of the management board of industrial zones and export processing zones did not agree. He has asked authorities not to permit the managers to work at the company. In the early afternoon, workers agreed to return to work. Ho Chi Minh City authorities recently announced that top executives of two more foreign companies fled the country leaving behind debts, taking the number of such firms in Ho Chi Minh City so far to five. Four of them are Korean and the other Malaysian and the companies have all shut down as a result, leaving 1,246 workers in the lurch. The companies owe the workers VND2.2 billion (US$129 million) in salaries. Vina Haeng Woon Co.,Ltd tops, with wages owed of VND1.3 billion, followed by Quang Sung Vina with VND553 million. The companies also owe their customers and the social insurance agency another VND4.8 billion.